Boccia is a fully inclusive sport played from a seated position. There are lots of local opportunities to get active across Derbyshire in different sports and activities. Within this section you will find details about inclusive sports clubs and groups as well as disability specific sessions. To find out what inclusive clubs or disability specific sessions there are in your local area, click on the 'Clubs and groups database' below. If you know of a session or club that we can add to this database, please get in touch so more people can find out about opportunities to get active and in sport. England Athletics have launched a 'Find a Guide' search for their Run Together programme. If you would like to start running and would like support from a guide, you can use the finder below to look for one in your area. Find out what sports you can get involved in. Parasport aims to encourage more disabled people to take up sport. They provide information about sports and sporting opportunities in local areas in a clear and easy-to-use format. Cerebral Palsy (CP) Sport work to develop 6 key sports and activities; Athletics, Bowls, Football, SportStart, Swimming and Table Cricket. You can also search for clubs, sessions and activities using the 'Club and Activity Search', click here. The Derby City Council website has information on local activities for people with a disability, including para-cycling, inclusive gyms and wheelchair basketball. 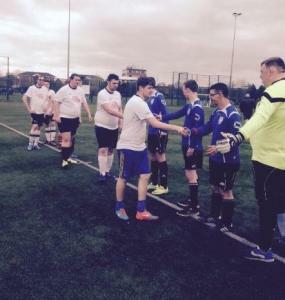 Riverside Football Club have players of all abilities. South Derbyshire District Council have a local sports directory with details of a range of sports and activities, from Angling to Walking. The directory shows which of these activities are inclusive for people with a disability and which are disability specific sessions. Sport offers a wide range of benefits to amputees including health benefits and providing a platform to communicate and socialise. To find out more about amputee sports including the different types on offer, click here. The Special Olympics (SO) Derbyshire network was set up in 2015, to help create a pathway of training and competition opportunities for people with Learning Disabilities in Derbyshire. SO Derbyshire deliver sports for people with a learning disability.